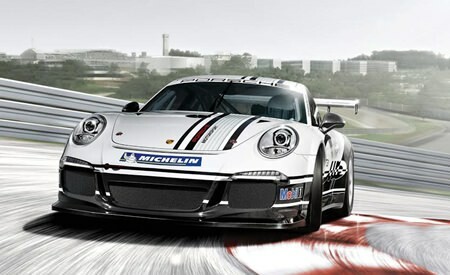 The Porsche 911 GT3 Cup is the motorsport version of the new 911 GT3 (Type 991). It is powered by a 3.8 liter, six cylinder boxer engine which generates 460 hp (338 kW) at 7,500 RPM, ten horsepower more than its predecessor. Power is delivered to the rear axle via a race clutch and a Porsche Motorsport designed six-speed dog-type gearbox with a mechanical limited slip differential. For the first time gear shifting is activated with paddle shifts on the steering wheel. The width of the Michelin race slicks was increased by two centimeters to 27 centimeters at the front and by ten millimeters at the rear axle to now measure 31 centimeters. Compared to its predecessor, the wheelbase has grown by 100 millimeters, improving handling at the limit, while Porsche Motorsport newly designed the forged single-piece 18 inch race rims with central locking. The new racing brake system improves the endurance qualities of the 911 GT3 Cup, and the internally vented and slotted steel brake discs are operated by aluminium six-piston racing calipers in the front, and four-piston units at the rear. Safety features have also been further enhanced, and drivers are protected by a newly calculated safety cage and newly designed race seat, while a rescue hatch in the roof enables easy extrication. The new 911 GT3 Cup combines maximum rigidity with low weight thanks to its aluminium-steel construction, and weighs 1,175 kilograms. I want one! Next articleBuild your own vintage car? Anyone wanting a hot BMW 7-Series?